If you can identify the object below please ignore the fact for just a moment and tell me what the image reminds you of. It looks to me like a leaf, complete with midrib and lots of ramifying veins. The dark nodules remind me of the sort of damage produced by certain aphid infestations. In fact, this is a photo of part of a sheep placenta delivered here the other day. The mammalian placenta is a fascinating structure and one which I have discussed before. Joanna agrees that the placenta is remarkable but wonders how an image of one will be received by those who frequent this blog. Mammals are classified as either monotremes, marsupials, or placentals and differ in the way in which they house and nourish their developing embryos. Monotremes such as the platypus have retained the egg-laying habit of their avian and reptilian ancestors, marsupials develop for a brief time within the uterus and complete their growth in an external pouch, and placental embryos develop within the uterus and are nourished by a remarkable structure called the placenta, the physical and chemical link between a mother and her developing offspring. The intent of this post is not to teach anatomy and physiology but to stop to appreciate this remarkable structure. 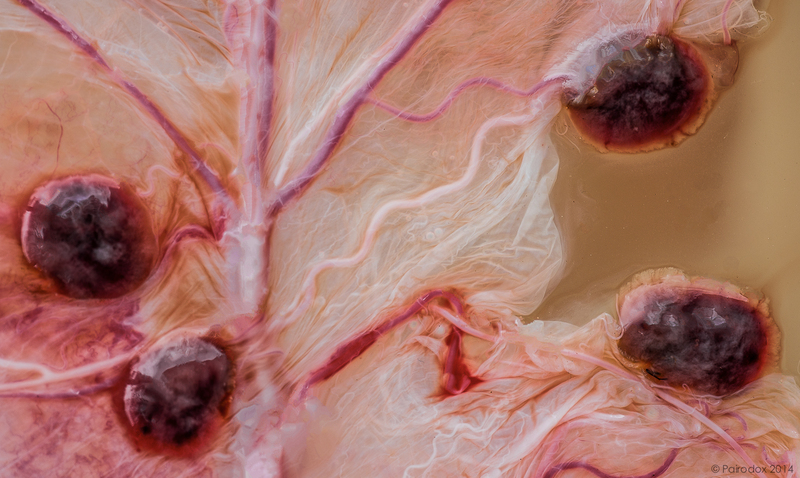 The image reveals the delicate membranes and blood supply so important in sustaining fetal life. The four nodules are cotyledons. Remember that a developing fetus is connected, via the umbilical cord, to the placenta. How the circulation of the placenta communicates and interdigitates with that of the mother is amazing. Suffice it to say that the two blood supplies do not mix (it is a popular misconception that they do) but are separated by the thinnest of protoplasmic layers. This syncytial trophoblast may be thought of as a single cell covering the entire placenta. The two blood supplies flow past one another so closely that material exchange may occur via diffusion and by active transport. Oxygen and all of the nutrients required of the developing fetus are supplied to and across the placenta and wastes such as carbon dioxide and urea are removed via the same route, but in the opposite direction. To increase the surface area for exchange, placental capillaries ramify and spread into twenty or more structures, the cotyledons, which then communicate with the maternal blood flow. Often I find myself admitting to my students that this sort of stuff is just crazy fascinating and crazy elegant. What do you think?